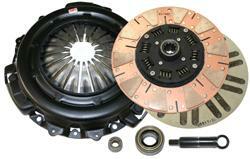 The Competition Clutch Domestic Stage 2.5 – 2375 TZ Segmented Kevlar / Cerametalic Clutch Kit is engineered to deliver a 60-65% increase in holding capacity with a little snappier engagement than the Stage 2. By adding the Ceramic to the plate side we enhance the torque capacity. This combination allows superb holding power with increased clutch life making the Competition Clutch 2375 Series Clutch ideal for selected street/strip.